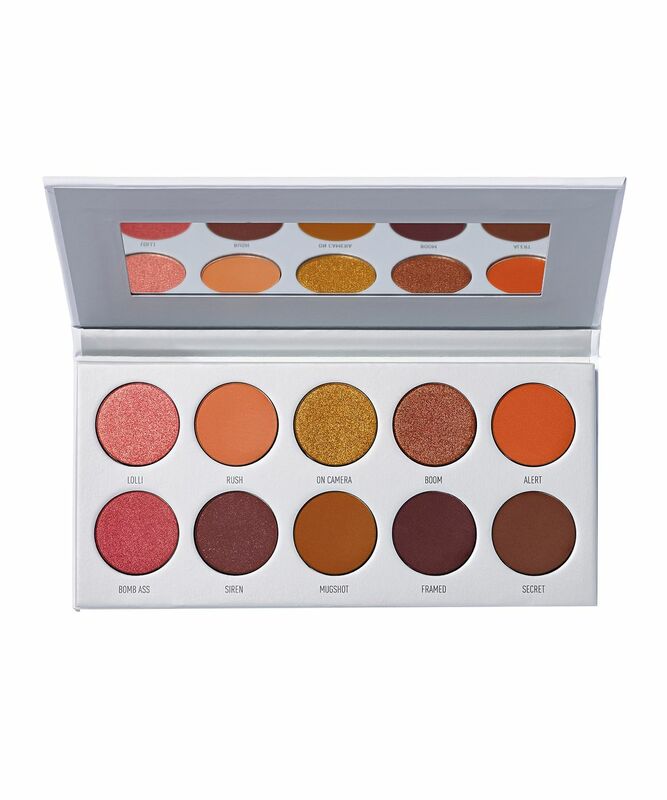 Following on from Jaclyn Hill’s five-star rated 35 Colour The Jaclyn Hill Eyeshadow Palette, Morphe have graced us with yet another Jaclyn Hill collaboration. This time in the form of her four vault palettes. Available in four different shade arrays (‘Ring The Alarm’, ‘Armed & Gorgeous’, ‘Bling Boss’ and ‘Dark Magic’) you’re sure to find a palette that will set your heart a flutter. Raging from crimson reds and dusty pinks to moss greens and marigold mustards, each pigmented pressed powder delivers on A-grade colour payoff and blendability for a smooth and long-lasting finish. Get in on the colour heist of the year. Jaclyn Hill is giving you the code to a killer vault where she’s stashed her top-secret shades in four badass palettes. Simply pick your favourite – or splash out and invest in all four (JACpot!) ‘Ring The Alarm’ unites 10 beautiful peach, rose, turmeric and praline hues for a rich and warm palette, ‘Armed & Gorgeous’ unites mustard, gold, orange and khaki hues ‘Bling Boss’ pays homage to purple with plum, violet and lilac hues and ‘Dark Magic’ marries sparkling silver with creams, greens and mochas. It’s safe to say we want them all and we’re totally obsessed! (ARMED & GORGEOUS) Mica, Talc, Dimethicone, Magnesium Stearate, Tridecyl Trimellitate, Phenyl Trimethicone, Nylon-12, Ethylhexyl Palmitate, Silica, Octyldodecyl Stearoyl Stearate, Kaolin, Polymethylsilsesquioxane, Isononyl Isononanoate, Isostearyl Isostearate, Capryl Glycol, Phenoxyethanol, Ethylhexylglycerin +/- May Contain/Peut Contenir: Titanium Dioxide (CI 77891), Iron Oxides (CI 77491, CI 77492, CI 77499), Chromium Hydroxide Green (CI 77289), Chromium Oxide Greens (CI 77288), Ultramarines (CI 77007), Ferric Ferrocyanide (CI 77510), Manganese Violet (CI 77742), Carmine (CI 75470), Red 40 Lake (CI 16035), Yellow 5 Lake (CI 19140), Blue 1 Lake (CI 42090). (BLING BOSS) Mica, Talc, Dimethicone, Magnesium Stearate, Tridecyl Trimellitate, Phenyl Trimethicone, Nylon-12, Ethylhexyl Palmitate, Silica, Octyldodecyl Stearoyl Stearate, Kaolin, Polymethylsilsesquioxane, Isononyl Isononanoate, Isostearyl Isostearate, Capryl Glycol, Phenoxyethanol, Ethylhexylglycerin +/- May Contain/Peut Contenir: Titanium Dioxide (CI 77891), Iron Oxides (CI 77491, CI 77492, CI 77499), Chromium Hydroxide Green (CI 77289), Chromium Oxide Greens (CI 77288), Ultramarines (CI 77007), Ferric Ferrocyanide (CI 77510), Manganese Violet (CI 77742), Carmine (CI 75470), Red 40 Lake (CI 16035), Yellow 5 Lake (CI 19140), Blue 1 Lake (CI 42090). (DARK MAGIC) Mica, Talc, Dimethicone, Magnesium Stearate, Tridecyl Trimellitate, Phenyl Trimethicone, Nylon-12, Ethylhexyl Palmitate, Silica, Octyldodecyl Stearoyl Stearate, Kaolin, Polymethylsilsesquioxane, Isononyl Isononanoate, Isostearyl Isostearate, Capryl Glycol, Phenoxyethanol, Ethylhexylglycerin +/- May Contain/Peut Contenir: Titanium Dioxide (CI 77891), Iron Oxides (CI 77491, CI 77492, CI 77499), Chromium Hydroxide Green (CI 77289), Chromium Oxide Greens (CI 77288), Ultramarines (CI 77007), Ferric Ferrocyanide (CI 77510), Manganese Violet (CI 77742), Carmine (CI 75470), Red 40 Lake (CI 16035), Yellow 5 Lake (CI 19140), Blue 1 Lake (CI 42090). (RING THE ALARM) Mica, Talc, Dimethicone, Magnesium Stearate, Tridecyl Trimellitate, Phenyl Trimethicone, Nylon-12, Ethylhexyl Palmitate, Silica, Octyldodecyl Stearoyl Stearate, Kaolin, Polymethylsilsesquioxane, Isononyl Isononanoate, Isostearyl Isostearate, Capryl Glycol, Phenoxyethanol, Ethylhexylglycerin +/- May Contain/Peut Contenir: Titanium Dioxide (CI 77891), Iron Oxides (CI 77491, CI 77492, CI 77499), Chromium Hydroxide Green (CI 77289), Chromium Oxide Greens (CI 77288), Ultramarines (CI 77007), Ferric Ferrocyanide (CI 77510), Manganese Violet (CI 77742), Carmine (CI 75470), Red 40 Lake (CI 16035), Yellow 5 Lake (CI 19140), Blue 1 Lake (CI 42090). So nice if you have blue eyes. The deeper shades ruin the whole palette... Shimmers worked fine and the transition shades were ok. A shadow popped out of the palette as soon as I opened it but I glued it back in... Save your money and buy a better palette. Tried to blend it omg it’s so horrible! The shades don’t blend at all and the they look very patchy on the eyes. Regret purchasing these palettes! So disappointed. So I brought Armed and Gorgeous as I really wanted some green eye-shadows. The green is patchy and hard to blend but it’s ok if I blend it with my MakeupGeek eyeshadows. The glitter/shimmers are great but got me apply better with fingers or when the brush is damp. I absolutely love my 2 palettes although I heard some very negative reviews I gave them a go and I'm very glad I did these are definetely my favourite palettes I own I had NO patchiness NO fallout and lots of pigment overall I personally think these palettes r super under rated and don't trust these beauty gurus on YouTube because they probably get paid THESE PALETTES R AMAZING DO NOT BE FOOLED BY FAKE REVIEWS!! It blend like a dream! love the texture as well. One thing that I noticed, you have to use a primer with these shadows, otherwise they do not last more thst 8 hours. It is important for me, as my days are quite long and the last thing I want to worry about is my eyeshadow staying put or fading in some 7 hours. All in all, they are solidly good eyeshadows, all shades are great, color setup is awesome, matte shades are juuuuuuust gorgeous. I had not heard great things about this palette range, in fact they had been dragged and touted as really bad palettes. Maybe I have an unpopular makeup opinion or maybe the formula has been adapted, however, I have the Dark Magic palette and love it! The shadows are very pigmented, blend well and look fab. My one negative is I wish the light matte shade was a little lighter as it is too dark for me to set with. Other than that I love it!!! 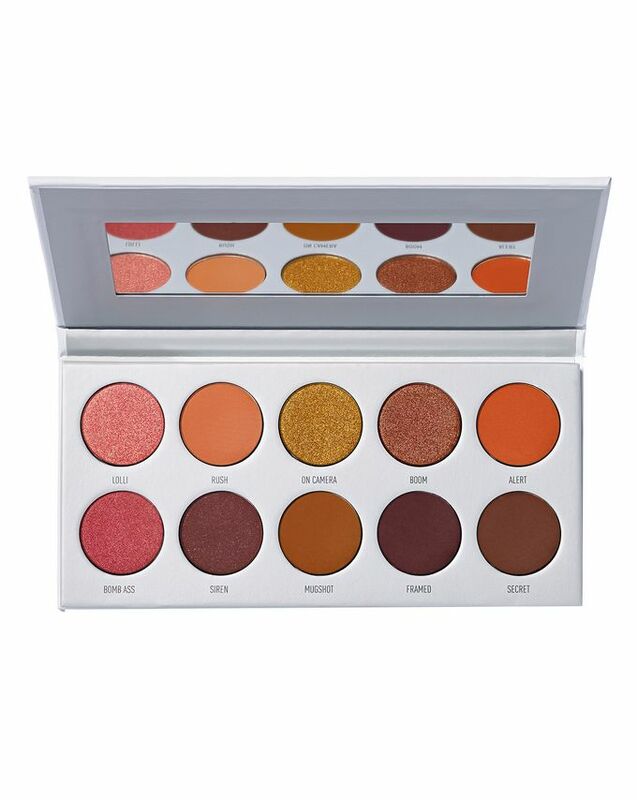 All shades are so ridiculously pigmented and you can easily make many different eye looks with just one palette. I think it's fake because I compared the package on the Morphe's website. And the package on the pallet from Morphe and Cult Beauty looked completely different. I was rather sceptical after reading some of the reviews of this pallet but I decided to take a chance as I’m always on the lookout for purples and pinks as they work so well with my green eyes. This pallet is fantastic! The colours are great, it blends well and if you use setting spray with the shimmers they really pop. It’s easily comparable to Huda and ABH and obviously a lot less expensive. The formula doesn’t upset my sensitive eyes and skin either - it’s a winner! Great colours (Dark Magic), swatched nicely. They blend extremely poorly, though, which is a real shame. When you've been at it for ages and it's still patchy, you know there's a real problem.